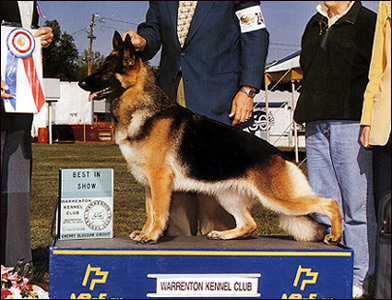 "Extremely feminine and beautiful, iron hard, this medium sized black and tan reached and then floated her way around the ring. Hard to fault anywhere, she was every inch a lady and every inch a winner." "Attractive black and reddish tan. Good back, down and back clean. Lifts a bit in forehand when gaiting." "Medium rich reddish black and tan. Excellent silhouette, good strong back, correct proportions, harmonious movement. What I'd like to see is a little more suspension and more attitude to perform. Excellent coming and going. No dentition problem."